Like many Americans, I intend on enjoying this Memorial Day weekend as a holiday that welcomes in the summer season. It’s easy to forget what this national holiday actually is about. While we enjoy a day off on Memorial Day we should all give thought to the real spirit of this day and what it represents for our country and each of us . Memorial Day, originally called Decoration Day, is a day of remembrance for those who have died in our nation’s service. 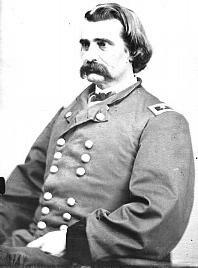 Memorial Day was officially proclaimed on 5 May 1868 by General John Logan(pictured above), national commander of the Grand Army of the Republic, and was first observed on 30 May 1868, when flowers were placed on the graves of Union and Confederate soldiers at Arlington National Cemetery. During this Memorial Day week the theme of the Presidential address is “Sacrifice” which pays tribute to American’s veterans,service men and women. Indeed, the sacrifices of our military should never go without sincere and enduring appreciation by all Americans. While we celebrate this Memorial Day of 2009,let us all remember that this appreciation extends not just on this holiday weekend but throughout each and every day of the year. The “National Moment of Remembrance” resolution was passed on Dec 2000 which asks that on Memorial Day at 3 p.m. local time, for all Americans “To voluntarily and informally observe in their own way a Moment of remembrance and respect, pausing from whatever they are doing for a moment of silence. Wanderingvets extends our thanks to all our veterans & members of the military on this Memorial Day of 2009.